A mercenary is typically thought of as a soldier-for-hire by entities other than his or her own country’s military. 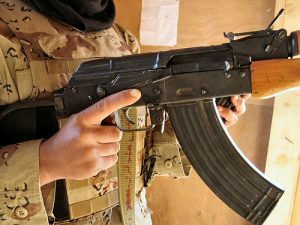 When seeking out a mercenary-like job, a common question asked on job applications is what type of guns the individual is either familiar with or qualified to shoot. Although most private security companies will provide proficiency and advanced weapons handling training, there is an expectation of a basic-level of firearms familiarity with common mercenary guns by the job applicant. These include various 9mm or equivalent handguns such as the Glock 9mm, rifles such as the M-4, M-16, and AK-47, and various other large caliber weapons. When seeking employment as a private security contractor, proficiency in one or more handgun types is a must for the majority of companies. The reasons vary depending on the nature of the job the person will be filling; however, when taking a job where one can be part of a personal protective detail the use of a concealed handgun is a requirement for most armed security details. most popular handguns on the public and military market. The company has more than 65 percent of the market share for U.S. law enforcement agencies and supplies a number of NATO and non-NATO armed forces and security agencies. The Glock 17 (9 x 19), 9mm pistol is used by the majority of law enforcement agencies who employ pistols across the world. The pistol is rated at above-average reliability and has a full magazine capacity of 17 rounds. The Glock 17 has a low overall weight (just over 22 ounces) and the Glock “Safe Action” trigger system designed for use in high-pressure situations in the field. If you are looking for Glock 17’s for sale in the United States to work on your shooting before applying for a private security or military job, they will typically retail for around $500 USD depending on the merchant and options you choose for the weapon. Action: A short recoil, tilting barrel, and locked breech. The Glock 26 Gen 4 is also known as the “Baby Glock” in industry. Rated at 9 x 19 mm, it has taken over from the 5-round snub-nosed revolver as one of the weapons of choice for concealed carry. The magazine has a capacity of 10 rounds and the weapon is rated as being very accurate. The Baby Glock sells new at around $500 give or take $50 USD depending on the state you are buying the pistol and can commonly be found in good or better condition used for around $400 USD. The Heckler & Koch HK45 is a 45 caliber German manufactured pistol. It was first made as an improvement over the USP45 and was released in 1995. The HK 45 improvements include changeable grip panels, better ergonomics, more ambidextrous controls, and a Picatinny MIL-STD-1913 accessory rail. The pistol (along with the popular HK45 Compact) was produced as a potential candidate for use by the U.S. military as a successor to the 9MM M9; however, the programs looking at a successor to the M9 were suspended before a replacement was selected. The HK45 makes use of a proprietary O-ring barrel to ensure a very precise barrel-to-slide lookup and maximizes the accuracy of the weapon. The HK45 models are able to be fitted with a threaded barrel to use with sound suppressors and are capable of firing a .45 ACP ball through +P ammo. Designed for personal defense, the HK45 is able to be converted to use a variety of trigger firing modes to include double action only (DA) or double action/single action (DA/SA). Well-suited for personal defense use, the HK45 is available in, or can be converted to, a wide variety of variants that use different trigger firing modes, including double action/single action (DA/SA) and DAO (double action only). Action: Browning-type tilting barrel, short recoil operated, and locked breech. Feed system: Detachable box magazine (10 round capacity). HK45C has an eight round capacity. Sights: Drift adjustable 3-dot or Super-LumiNova night system. 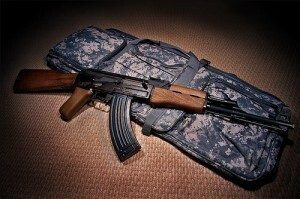 assault rifle first made in the USSR and is also known as the Kalashnikov. 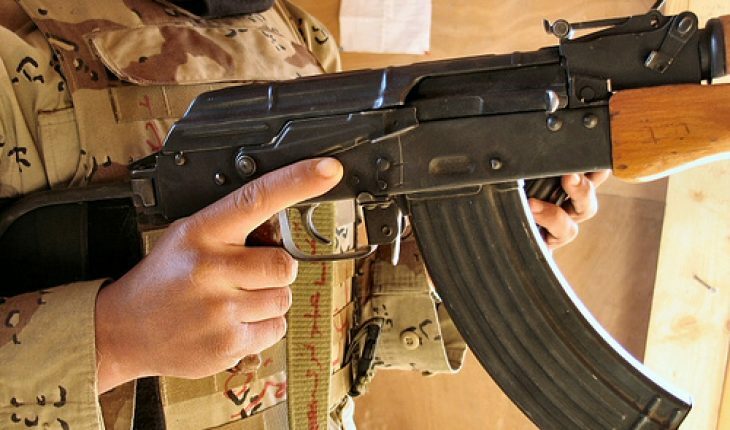 Due to the rifle’s low cost, ease of use, and durability, it continues to be one of the most used assault rifles by mercenaries, rebels, and militaries around the world. Today, the AK sees production in a number of countries and is almost considered a must for merc-like work to be able to operate the weapon. – AKM weight with unloaded magazine 3.1 Kg. Feed system: Standard magazine with a 30 round capacity. The rifle also has: 10, 20, 40, 75, or 100-round detachable box and drum style magazines available for use. Sights Adjustable iron sights with a 378 mm (14.9 in) sight radius. The AK-47 has adjustments available between 100-800 meters. The AKM has 100-1,000 meter adjustments available. The M-4 carbine is the current weapon of choice in the U.S. armed forces and refers to a family of related firearms based on the M-16 and AR-15 rifles. The M-4 is lighter and shorter than the M-16A2 rifle and has approximately an 80% parts commonality with the rifle. The M-4 is magazine fed, gas-operated, and shoulder fired with a telescopic stock. The M-4’s barrel is 14.5 inches (370 mm) in length which makes it easier to use in urban or close quarters combat than the M-16. The selective fire options for the rifle include three round burst, semi-automatic, fully auto, and are capable of mounting the M203 and M320 grenade launchers. Due to the widespread use of the M-4 by the United States Armed Forces, it is one of the common rifles that private military companies expect their employees to be able to effectively use. Action: Gas operated, rotating belt. Effective range: 500 m for a point target and 600 m for area targets. Feed system: 30 round box magazine and other approved STANAG magazines. Sights: Iron or various optics packages. The H&K 416 is a popular assault rifle manufactured by Heckler & Koch. The rifle makes use of the AR-15 platform and was originally designed as a major improvement to Colt’s M-4 carbine. The 416 makes use of a gas-piston system derived from the H&K G36. The rifle uses standard NATO ammunition, 5.56 x 44mm and is used by a number of armed forces throughout the world to include the U.S. Special Forces and some use by the U.S. Marine Corps. Muzzle velocity: Depends on the type of round and barrel. the Soviets in the 1950s. The gun was produced in parallel with the AKM assault rifle and was first created to replace the 7.62x39mm RPD light machine gun. Despite its age, the RPK continues to be used by a number of African, Asian, and former Soviet Union countries today. The rifle was also manufactured in Poland, Bulgaria, and Romania and functions identically to the AK-47 using the same ammunition. The rifle has had modifications to help increase its accuracy, effective range, and sustained fire capability. Other features of the RPK include having a longer and heavier barrel than the AKM allowing it to conduct sustained fire for longer periods of time than the AK-47. The barrel of the rifle is permanently fixed to the weapon’s receiver and is not designed for field replacement. Other features of the RPK include a front sight base, under-barrel cleaning rod guide, folding bipod mounted near the muzzle, and a front sight base with lug. The muzzle of the gun is threaded which allows it to be used with compensators, blank firing adapters, and flash hiders. Action: Gas operated, rotating and closed bolt. The 7.62 mm PK/PKM machine gun is another Soviet-era assault rifle that is still produced to this day in Russia. The PK was originally manufactured to replace the RPD and SGM machine guns in use by the Soviet army. Today it remains a vehicle-mounted and infantry weapon in the Russian armed forces and has been exported extensively by the Russians. The PKM is the modernized version of the PK and first saw service in 1969 and is also in use today. Weight PK: 9 kg (19.84 lb) (gun + integral bipod) + 7.7 kg (16.98 lb) (tripod). PKM: 7.5 kg (16.53 lb) (gun + integral bipod) + 4.5 kg (9.92 lb) (tripod). Rate of fire: PK, PKM: 650–750 round/min. It would literally be impossible to list every single weapon an individual may encounter or be expected to use while accomplishing mercenary work. Other than the highly popular weapons already highlighted in this article, other guns you may expect to run into in the field or home office while doing merc work are: 1911, FNFAL, HK-91 (or any HK weapon), MP-5, M-249, and the Sten SMG. 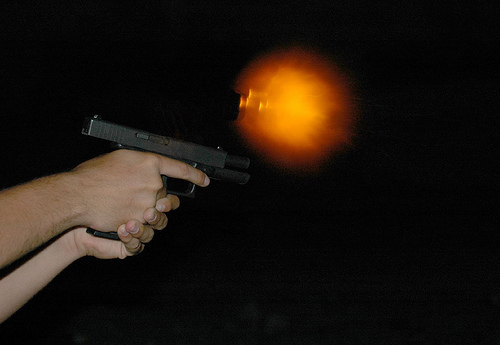 Becoming proficient in one or more types of weapon in each category (pistol, rifle, etc.) will help you quickly learn to shoot new variants of guns as they become available during your future work.